REGISTRATION IS OPEN! Click here to submit an abstract / register! 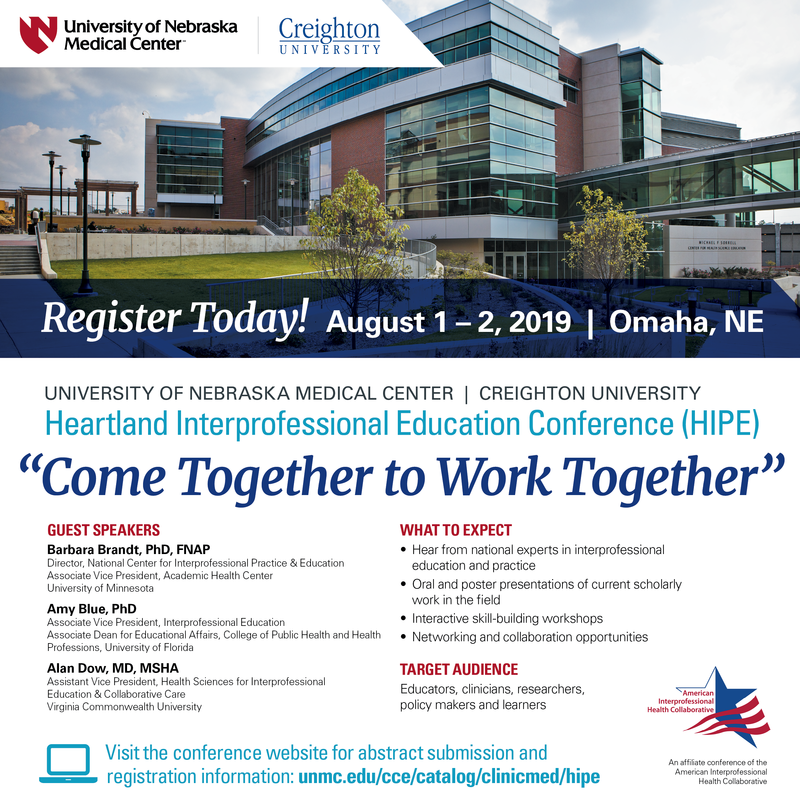 "Come Together to Work Together"
The 2019 Heartland Interprofessional Education Conference provides an opportunity for learners, scholars, and practitioners in the field of interprofessional education and healthcare to share knowledge, build skills, experience professional development, and form collaborative relationships. Abstracts should represent original work in the areas of interprofessional practice, education, or research. Faculty, staff, student, and practitioner submissions are welcome. All submissions will be completed online through the conference website. Abstract Submitters should receive notification of acceptance decisions by May 1, 2019. UNMC's Interprofessional Education (IPE) program allows students to learn and work together in order to optimize their unique strengths and increase the quality of care for their patients. Our program seeks to provide students with the skills needed to meet the challenges of a rapidly changing health care field, particularly taking into account a greater emphasis on team-based care, the growth of innovative care models such as the Patient-Centered Medical Home, and the focus on measurable quality and safety outcomes. IPE requires involvement from students and educators representing all the health care disciplines. As such, it offers unique opportunities for collaboration across departments, colleges, and campuses. Questions about what we do? Reach out! Link out to the Interprofessional Education Collaborative here! "Interprofessional education occurs when students from two or more professions learn about, from, and with each other to enable effective collaboration and improve health outcomes. Once students understand how to work interprofessionally, they are ready to enter the workplace as a member of the collaborative practice team. This is a key step in moving health systems from fragmentation to a position of strength." Source: World Health Organization (WHO), (2010), Framework for action on interprofessional education and collaborative practice. Geneva: World Health Organization.